An interesting aspect as to the differences in the cutting methods used by the marquetarians in the UK and those marquetarians on the "other side of the pond" in the USA has been brought to light recently from within the friendly environs of our Redbridge Marquetry Group. The cause of this interesting debate and the ensuing observations was due to the introduction to our group of a review copy of Silas Kopf's excellent "The Master Techniques of Marquetry" DVD. This DVD, (which was produced in the USA) has been circulating among the members of the Redbridge Marquetry Group recently and it has inevitably brought to our attention the subject of the differences in thickness between the USA sourced veneers and the veneers we use here in the UK. This perceived difference is that the USA veneers are twice the thickness of the UK veneers (1/32 or 1/28th of an inch USA - 1/64th of an inch UK). That difference in the thickness of the veneer stocks obviously obliges us both to use different cutting methods due, primarily, to the added difficulty of attempting to "blade" cut veneers at 1/28th of an inch thick that are stinkers to cut when they are only 1/64th thick!, I'm sure you'll appreciate the problems involved. To illustrate those different cutting methods we are including several clips taken directly from Silas's DVD along with some photos of our RMG members hard at work with their 1/64th inch thick veneers and using their trusty scalpel blades! 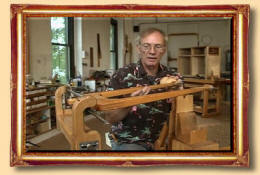 In this first "clip" you can see Silas using a standard "frame" style of saw and blade. 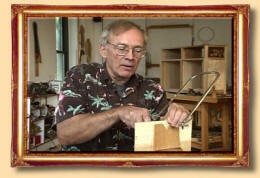 It's actually much the same type of tool as you will see our Alf Murtell using in his piercing saw tutorial. As Silas is a furniture maker he generally uses packs of veneers, (often up to ten veneers in the pack) in order to ensure consistency of design when multiple marquetry inserts depicting the same design are required for a piece of furniture. A very important tool that's being used by Silas in this photo is a foot operated clamp, of which you can see a detail below. Silas operates the clamping system by opening and closing the clamp by just pulling the foot bar towards or away from him. 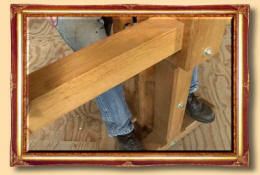 This method leaves both hands free to use the frame saw without restriction and to manipulate the veneer pack as required. The clamp system Silas is using is obviously a large piece of equipment and would necessitate a decently sized work shop. If you are limited with your space, you could use the arrangements that you will see our Alf using in his piercing saw tutorials. The saw you see Silas using in this photo runs on an arrangement of "slider" bars that ensure that the saw blade will cut the veneer pack (of perhaps ten veneers or more) at an exact 90 degrees to the face of the pack. This will ensure consistency of the cut, right through from the veneer at the front of the pack, on to the veneer at the rear of the pack. When the cut pieces are assembled in the projected design there will be a uniformity achieved with this cutting method that would not really be possible with blade cutting. As you will see in the picture on the right, the standard method of veneer cutting in the UK is to use the blade or scalpel method. This style of cutting works well enough with our 1/64th of an inch thick veneers, but with the USA veneers at 1/28th & 1/32nd of an inch thickness, you will find that the blade would be difficult to control properly. The thicker veneers will "catch" the blade of your scalpel so much that you will find yourself yearning for the ease that saw cutting would promise you. This photo shows a picture being cut with a scalpel. A steel rule is being used for achieving a clean straight cut across the border mitre. Because 1/64th inch thick veneers are used, a certain amount of spontaneity is available to the marquetarian that is only really possible with the freedom of blade cutting. 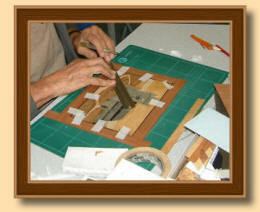 With saw cutting the design has to be drawn on to the veneer so that you have a guide line for the saw blade to follow. Scalpel cutting does allow the "spear point" arrangement which is used for "blending" one veneer into another. Saw cutting would rather preclude this method. In this photo on the right you can see Silas using the "parallel" saw on a veneer pack. This saw uses the same clamp arrangement that we saw Silas using with his hand held frame saw. On the next page you will see some examples of the veneer packs that Silas assembles for use with this parallel cutting saw. You will also see some of the completed marquetry designs - and - especially for my own personal envy - that wonderful old Leviathan of a press that Silas uses. It's a superb piece of heavy engineering! In the above you will have seen the main differences demonstrated concerning the cutting techniques required for dealing with the variations of veneer stock found between the USA and the UK. Those saw cutting techniques have the inbuilt advantage of accurate packet cutting which guarantee you a uniformity of repetitive pieces that it would be extremely difficult to replicate with the scalpel method. On the other hand, as we said earlier, you do have the freedom to perform spontaneous cutting with the scalpel blade that, in itself, would not really be possible with the saw methods. As you see, both methods have their own distinct advantages and disadvantages. One further advantage with those thicker veneers is that you will stand less chance when doing your "finishing" of "rubbing through" your pictures' veneers into the base board as often happens with our thinner veneers, and, oh! what an awful sinking feeling that gives you when you see all your hard work disappearing in a cloud of sanding dust! 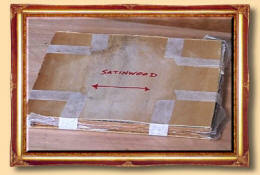 The photo on the right shows a veneer pack assembled together ready for the design to be placed on it and then 'cut out'. 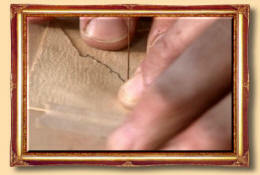 Between some of the sheets of veneer a few pages of waxed paper have been inserted in order to lubricate the saw blade. It's much the same approach as we use when we dip the tip of our cutting blade in a piece of wax to lubricate the cutting point to avoid the "pulling" of the blade. 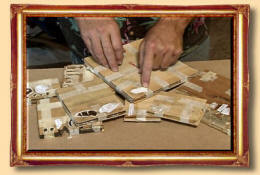 A series of "veneer packs" with the various parts of the design placed upon them have been assembled ready for cutting. The packs have had "pilot" holes drilled in them at strategic positions in order to facilitate the insertion of the thin saw blade. Each pack contains a different variety of veneer which, when each cut piece is assembled, will supply a specified amount of pre-cut items that will fit neatly and uniformly into the main body of the work, thus ensuring a continuity of design across the final project. In this photo you will see that Silas is building up the design of a Lilly using single sheets of the thicker USA veneers together with an electric "piercing" type of saw. Unfortunately with the saw method you are rather prohibited from using the "window" method (which we favour for our blade cutting techniques). Obviously, if you so desired, you could make an attempt at the window method with the saw, but I rather think that the saw blade would very easily cut through your window veneer as well as your "insert" veneer without "batting an eyelid" if you allowed it to! Here you see Silas using the saw blade to cut an intricate part of the design. 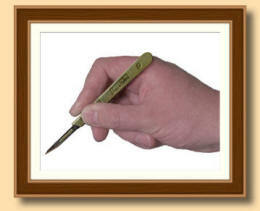 The blade follows the pencil line with great accuracy. It also gives you the added advantage of being able to cut through two adjoining parts of the design veneers at the same time and thus ensure a perfect fit when you join the veneers. As you see here, the blades used for these saw cutting techniques are almost like fine wires. They are of a thinness that allows you to cut your veneers with great accuracy. 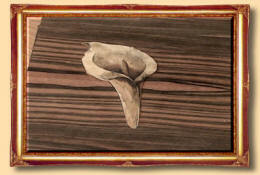 The finished Lilly placed in it's well selected backing veneer. Although no blade cutting was used - or no "window method" - you will note that the cutting is very clean and the veneers have none the less, blended extremely well. I have come to the conclusion that there is a lot to be said for the saw cutting methods used in the USA. As you see here, they can produce some excellent results. I think it would be nice to see what would happen if both methods were used on one picture - that would be very interesting! 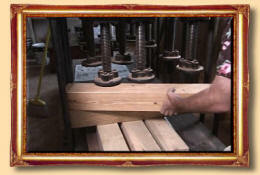 Well, we couldn't finish this piece without giving you a view of Silas's press. What a monster of a press this is! How many of us marquetarians would love to own such a superb item of machinery? I bet this couldn't half produce some tonnage of pressure - and look at the bed size of the beast - what dimensions of picture could you place in that I wonder? We hope you have found this article interesting. 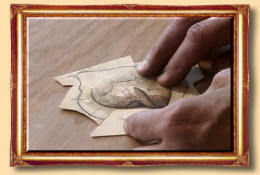 It highlights an obvious difference in the marquetry techniques placed upon the marquetarians who reside in different continents and is due solely to the basic thickness of their veneer stocks. As we said earlier on in this article, both cutting methods have their own advantages and disadvantages - so, ultimately, the choice of cutting is yours! 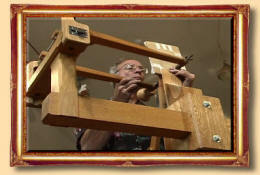 I would thoroughly recommend Silas's "saw cutting methods" DVD entitled "The Master Techniques of Marquetry" as an object lesson in how saw cutting should be done. There is only one small restriction for UK residents and that is that the DVD is in the USA "NTSC" format and may not play properly in some of the early DVD players - however, if you have a computer with a DVD player in it, it should play perfectly in that. All the photos in this article are taken directly from the DVD with no other intervention save for the gold frames, so you can see how good the actual visual quality of the disk really is - and the sound quality is also of that same high quality!